I am an EM resident and a rather new reader of your blog. I am writing to ask for your opinion on an ECG one of my colleagues recently came across. The patient was a 70-something yo previously healthy male on no medications who presented to the ED with epigastric pain, onset over a few hours. He denied chest pain of any sort and his vitals were all normal. Smith interpretation: There is LBBB with all discordant ST segments (in the opposite direction of the QRS). The Smith modified Sgarbossa criteria diagnose OMI if there is an ST segment that is at least 25% of the preceding S-wave. Measurement is made at the J-point relative to the QRS onset (PQ junction). The mean maximal ST/S ratio in non-ischemic LBBB is about 0.11. Any value over 15% is abnormal. So 0.19 (19%) is abnormal. So even at a ratio of 0.19, there is still a high probability of occlusion. Thus I would be extremely worried about inferior OMI and obtain serial ECGs and stat echo, or just activate the cath lab. "There was no old ECG for comparison and the inferior leads may show a little excessively discordant ST change but the patient was otherwise well and therefore admitted to the surgical ward. Unfortunately, this was not appreciated, and the patient went into ventricular fibrillation approximately 30 min after the 2nd ECG, and could not be resuscitated. Beware any discordant ST elevation that is greater than 15%. If greater than 20%, it is very likely OMI, even if it does not meet the 25% criterion. Criteria of any kind are only guidelines and not to be strictly followed! The modified Sgarbossa criteria are only 80% sensitive for OMI!! The STEMI criteria in normal conduction are only 75% sensitive for OMI!! The 4-variable LAD occlusion formula is 80-90% sensitive at a cutoff of 18.2!!! Is there excessively discordant ST Elevation in this ECG with Left Bundle Branch Block? Hindsight is 100% in the retrospectoscope. Our gratitude to the clinician who submitted this case — as it is one we allcan learn from. For clarity — I’ve straightened and relabeled the initial ECG in this case ( = ECG #1, or the BOTTOM tracing in Figure-1). For illustrative purposes — I’ve added in the TOP of Figure-1 an example of LBBB without associated acute OMI ( = Exhibit A). 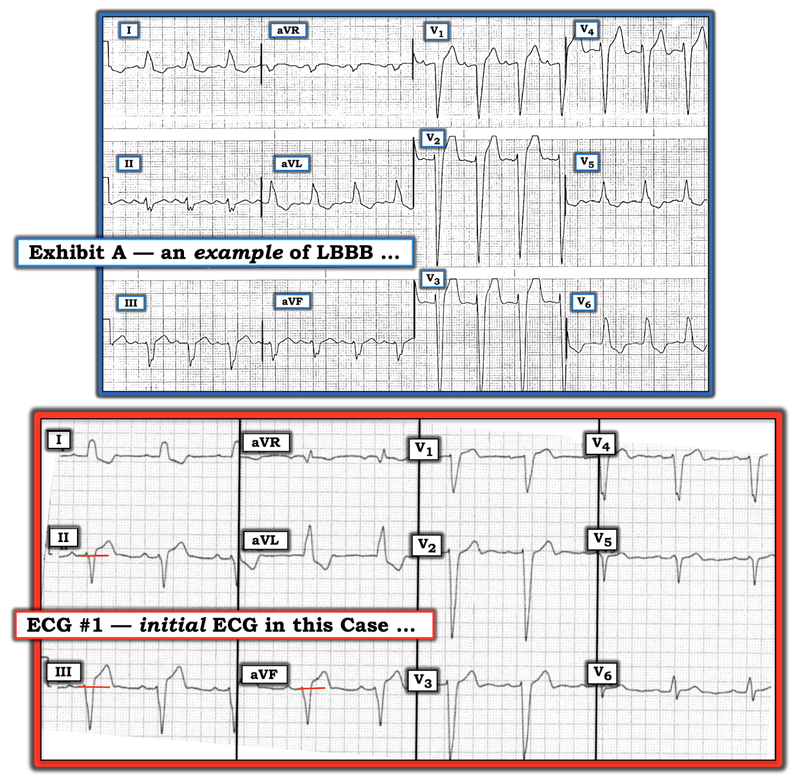 Figure-1: The initial ED ECG in this case ( = ECG #1) — and in the TOP of this Figure ( = Exhibit A), an example of LBBB without associated acute OMI (See text). COMMENT: This was a difficult case! Changes of acute OMI were readily apparent in the 2nd ECG recorded in this case, obtained several hours after admission. This 2nd tracing (shown above) — highlights the value of a comparison ECG, especially in cases of LBBB in which early ECG findings of acute OMI are often more challenging to recognize. Lead-to-lead comparison between the 2 ECGs obtained in this case should leave little doubt that there has been marked change (progression) in both the shape and amount of ST elevation in multiple leads. Changes suggestive of acute OMI were far more subtle for this initial tracing ( = ECG #1 in Figure-1). Recognition of this was made all the more difficult because: i) The patient had NO chest pain; and, ii) NO prior ECG was available for comparison. As per Dr. Smith — application of modified Smith-Sgarbossa criteria yielded an abnormal result for assessment of ECG #1 (detailed analysis by Dr. Smith above). Qualitatively — the shape of ST segment deviations in ECG #1 of itself is suggestive of a possible acute change. Perhaps the best way to illustrate this — is by comparison with another example of LBBB not associated with acute OMI ( = Exhibit A in Figure-1). I’ll emphasize that there is great variation in the spectrum of LBBB appearance. Not all cases of LBBB look like Exhibit A. Nevertheless — I believe the example of LBBB that I’ve chosen for Exhibit A helps illustrate the qualitative principles I discuss. Note that there is no more than minimal J-point ST elevation in lead III of Exhibit A. The other inferior leads don’t manifest any J-point ST elevation at all. There is J-point ST elevation in 4 of the chest leads in Exhibit A (ie, leads V1-thru-V4). However, the J-point is not distinct — but instead, is rather “elusive”, in that there is a gradual upsloping concavity to the ST segment. Modified Smith-Sgarbossa criteria are negative for these 4 chest leads in Exhibit A — because the S waves in these leads are so very deep. There is ST-T wave depression in virtually all lateral leads in Exhibit A. That said, this is not ischemic — but rather a typical manifestation of LBBB. In summary — ST-T wave shape in Exhibit A looks benign (ie, typical for a patient with LBBB). I’ve added short RED horizontal lines in the inferior leads to clarify the ST segment baseline. These horizontal lines facilitate recognition of how much the J-point is elevated. There is rapid ascent to this J-point — and the J-point is discrete. This same abnormality is seen in all 3 inferior leads. This ST segment shape in all 3 inferior leads looks worrisome, and may indicate primary ST elevation. As per Dr. Smith — there is typically some (often slight) ST elevation in anterior leads in association with LBBB. There should not be any ST depression at all in leads V2 and V3. As a result — the shape of the ST-T wave in lead V2 of ECG #1 is not normal. Given how deep the S wave is in this lead (>30mm! ) — I would expect at least slight ST elevation, and there is none. NOTE: Assessment for LVH is clearly more difficult in the presence of LBBB. Since LBBB changes the sequence of ventricular depolarization — the usual voltage criteria for LVH diagnosis do not pertain. In addition, the sequence of ventricular repolarization is also changed. As a result — the asymmetric (slower downslope; more rapid upslope) shape of ST segment depression that we see in both examples of LBBB in Figure-1 are expected secondary ST-T wave changes that are typically seen with this conduction defect. They cannot be assumed due to LV “strain” (and they cannot be assumed to represent ischemia). Virtually all patients with complete LBBB have some form of underlying heart disease. As a result — statistically, patients with LBBB make up a high-prevalence population for LVH. The presence of very deep S waves (ie, >25-30mm) in one or more anterior leads (ie, V1, V2 and/or V3) is highly correlated with LVH in patients with LBBB. This suggests that both of the ECGs in Figure-1 have LVH. BOTTOM Line: In the absence of chest pain and NO prior tracing for comparison — I was not initially certain that ECG #1 represented acute OMI. But I was suspicious — for the reasons I discuss above. Repeating the ECG much sooner than several hours later may have been enlightening. When in doubt about the findings on an initial tracing — repeating the ECG within ~15 minutes is advisable. Use of other modalities (ie, troponin, Echo at the bedside) may have also helped to recognize ongoing acute OMI sooner. FINAL Thought: Use of modified Smith-Sgarbossa criteria can very helpful in assessing patients with LBBB by the easy-to-calculate, objective rating scale that facilitates identifying patients with higher probability of acute OMI. With practice and experience — qualitative assessment of ST-T wave shape can instantly provide similar diagnostic assistance. I favor use of both methods to hone your diagnostic skills! I think the combination of several ECG abnormalities, though not providing a definitive diagnosis, is highly suggestive for OMI, until proven otherwise. As per Dr. Smith, there is excessively discordant STE in inferior leads with an ST/S ratio ~19%; moreover, T waves in inferior leads look fat and large, surely a concerning morphological feature. These inferior abnormalities are matched by excessively discordant ST depression in aVL whose ST/T ratio according to my calculation is >30% that, was if I recall well, the most accurate and sensitive criterion. Another concerning abnormality is, as per Dr. Smith, the presence of slight ST depression in V2. In this regard (=in the context of LBBB), we should have expected ST elevation especially because there is probable LVH given the deep S waves in V2-V3; in other words, I would have expected a false positive in V2 with an ST/T ratio >0,25%, whereas V2 shows just isoelectric or even minimal ST depression (posterior involvement?). Anyway, the presence of epigastric pain combined with concerning ECG abnormalities suggesting OMI should lead to the usual wise and prudent approach based on serial ECGs, bedside echo etc. Dr. Smith, thank you for another highly instructive case with several learning points! I cannot appreciate a depressed J point in V2. Do u mean compared to j point in v1 n v2 in which it is elevated and in v2 it suddenly becomes isoelectric? The j-point in V2 is just minimally depressed, about 0.5 mm or even less. But ANY amount is abnormal. I may be incorrect, but look at V6. there seems to be concordant ST segment elevation. certainly not the ST segment depression one might expect (? ); also a poor, blunted R wave progression V1-6 , ? c/w infero-lateral involvement. thank you for another good teaching case, tragic for this patient. This is really a concordant T-wave, without concordant STE. If there is concordant STE, it is tiny fraction of mm. We have published 2 studies on this. Concordant T-waves, or a tiny amount of concordant STE, are both slightly specific with very low PPV. Dodd KW. et al. COMPARISON OF THE QRS COMPLEX, ST-SEGMENT, AND T-WAVE AMONG PATIENTS WITH LEFT BUNDLE BRANCH BLOCK WITH AND WITHOUT ACUTE MYOCARDIAL INFARCTION. JEM 51(1):1-8; 2016. Meyers HP et al. EVALUATION OF T-WAVE MORPHOLOGY IN PATIENTS WITH LEFT BUNDLE BRANCH BLOCK AND SUSPECTED ACUTE CORONARY SYNDROME. JEM 51(3):229-237; 2016. And there is also slight concordant STE of 0,5 mm in V6 in my opinion that also raises suspicion of OMI. Great post! Do you think that the real but subtle concordant and flat ST elevation in V6 of the first ECG, event if it doesn't meet the modified Sgarbossa (≤ 1mm), also increase the probability of OM ? Thanks again Steve, Ken and Pendell. Is the ST-segment discordant to the QRS complex in V6 of first ECG? I think you're asking it if is concordant. Apparently, many see it that way, but if it is present it is minimal! Dr. Smith: You begin your interpretation with "There is LBBB with all discordant ST segments (in the opposite direction of the QRS)". Does this also include V6 of ECG 1? Would you elaborate on the changes between ECG#1 and the ECG recorded several hours later? They look different. What physiological changes might lead to the changes we see with these two ECG’s? Dr. Smith commented on the change in the 2nd ECG in this case (under the Figure of this 2nd ECG). My Thoughts — I agree with Dr. Smith that this 2nd ECG shows marked evolutionary changes of this ongoing large OMI. When I do a lead-by-lead comparison with ECG #1 — I see clearly more ST elevation in each of the inferior leads PLUS a “rounding out” of the upslope of each ST segment that was NOT present in ECG #1. We see this SAME “rounding out” in the ST depression as an acute reciprocal change in each of the 2 lateral limb leads ( = leads I and aVL). Given that there is LBBB — a QS complex in an inferior lead is not per se necessarily abnormal — BUT — in the context of these acutely evolving ST-T wave changes in these 5 limb leads — I suspect this loss of the small initial r wave in leads II, III and aVF that we saw in ECG #1 IS significant, and indicative of this large inferior MI. In the chest leads — lead-by-lead comparison shows marked increase in T wave amplitude (with J-point ST elevation in lead V3, and to a lesser extent in V2). My guess from the fact that ST-T wave changes are most marked in the inferior leads, is that the OMI was of the RCA — though I’m not sure of the anatomic reason for the changes we see in the chest leads … No cath was done (the patient died). I think it safe to say this was a very large OMI … P.S. I don’t think we can determine if the loss of R wave amplitude in the 2nd ECG in lead V6 is meaningful (ie, loss of positive forces) or simply due to a lead placement difference … but that doesn’t change the overall impression of a very large OMI.